New solo drivers with about 120 hours of experience have a crash risk 30% lower than new drivers with only 50 hours of experience. Plan your practice and experience using the Learner Kit, focusing on practising the skills that will make you a safer driver. New drivers often don’t see or anticipate the potential hazards around them, or see them too late. Young drivers usually have good reaction times (important) but poor hazard perception skills (much more important). You need to know exactly what is happening around you at all times because potential hazards can be anywhere. Learning to scan constantly will better enable you to anticipate hazards and respond appropriately. Effective scanning is taking in the complete road environment by looking ahead, to the sides (using head checks) and in rear view mirrors. Scan to make sure you see everything around you when reversing, changing lanes, merging or pulling out to overtake. 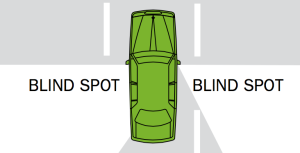 Blind spots (areas behind the driver that can’t be seen using only mirrors) must be head checked by moving your head and quickly looking over your shoulder. 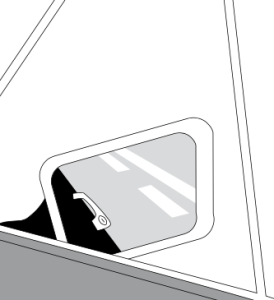 After positioning the driver’s seat appropriately, adjust your mirrors so there is an overlap between the view from your outside and inside mirrors. Your outside mirrors should just show the edge of the car. A good guide is to be able to see the rear door handle in the bottom corner as shown. With every driving practice your performance will get smoother, you will make better decisions and your hazard perception skills will improve. The Learner Kit has a 4-stage plan for learning to drive that is the best way to make sure you are ready to drive solo by your Drive Test. Also consult ‘Lessons from the Road’ (vicroads.vic.gov.au/supervisors) to help you and your supervisors understand the role. The ‘L site’ (lsite.vicroads.vic.gov.au) also includes information, activities, practice suggestions, and resources you and your supervising driver might find useful. Stage 1- controlling your car. Gets you to start, stop and steer safely in a quiet area without traffic. Stage 2- applying car-control skills and looking out for road users on quiet roads with little traffic. Stage 3 uses your Stage 1 and 2 skills on busier roads and in more difficult situations. Learn to deal with traffic and hazards to be safe in varied situations. Stage 4 driving as if you are a solo driver. While still using L plates and a supervisor, make most of the decisions yourself. This builds solo experience in varied situations so you’ll be ready to drive on your own. You can become the family chauffeur for everyday activities like going to the shops or school. The Guide for Learners and the Guide for Supervising Drivers contain detailed advice about each stage and include checklists and information about stage progression. Supervising drivers provide the extensive practice opportunities you need. They provide an extra pair of eyes to watch the road, help anticipate hazards and assist in decision-making. Help supervising drivers by ensuring they read the Guide for Supervising Drivers. You and your supervising drivers should plan sessions using the 4-stage plan, keep track of your progress, keep your log book up to date, and keep motivated to keep practising through the learner period. As you progress through the 4 stages you will take more responsibility for your driving and your supervising driver will do less. You need to practise in a broad range of different conditions while you have your supervising driver so you won’t encounter difficult situations for the first time as a probationary driver. This should include driving at night, in wet weather, peak and off-peak traffic, on roads with different speed zones and on sealed and gravel roads. Use the Learner Kit to help you decide what sort of driving you should be doing. Use your Learner Log Book to keep track of your hours and type of practice. Use the Guide for Learners to decide when to practice on different road types and driving conditions. Take every opportunity to practise (10, 20, 30, or 60 minutes) as frequent short drives are more productive and less stressful than few long drives. Car control: steering, braking, and using pedals, buttons and other controls. Visual scanning: more experienced drivers scan to the sides of the car, use mirrors and scan further ahead where new drivers focus on looking forward. Identifying and responding to risks: experience in different driving situations helps you to recognise hazards and respond to risky situations. Making decisions:experience in different driving situations helps you to make many driving decisions (when to slow down / accelerate, what speed is best for the conditions, when to change lanes or overtake) more quickly – giving you time to concentrate on safe driving. You should be driving without relying on your supervising driver long before the Drive Test. This is why Stage 4 focuses on taking full responsibility for driving in different situations. You will not be ready for the Drive Test until you have completed the Stage 4 checklist. This may take more than 120 hours. Use the checklists in the Guide for Learners and the Guide for Supervising Drivers to monitor your progress. More practice = a better-prepared and safer driver.